With xenophobic attacks spreading in the Gauteng and Kwazulu Natal regions of South Africa, it appears that the instigators of this violence have forgotten the history their country shares with the rest of the continent. During apartheid, it was independent Africa that supported South African nationalists in their struggle for freedom and justice. Before his imprisonment on Robben Island, Nelson Mandela made a trip around the continent, seeking aid for the ANC – and in most cases, receiving it. Zimbabwe, the leader of the frontline states in Southern Africa, condemned apartheid and often called for economic sanctions against the South African government. Now, in an attempt to find scapegoats for the social and economic problems facing the country, some South Africans have turned to “foreign” Africans living in the country as the cause for the high rate of unemployment. 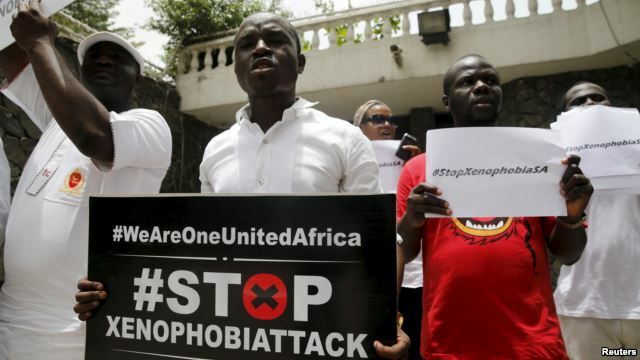 Zimbabweans, Nigerians, Malawians, and hundreds of other people who hail from the rest of Africa, have been targeted in the recent attacks. This Pan-African sentiment of continental unity has failed to garner an effective response from either the SADC or the African Union. Jacob Zuma condemned the violence in parliament, but police in Durban and Johannesburg have been unable to fully curb the attacks. On April 16, thousands of people gathered in Durban to protest the violence, chanting, “a united Africa!” and holding signs showing solidarity for their fellow Africans. But not all elements in the country realize this, and the violence has continued. This is not the first time that xenophobia has reached this level in South Africa – in 2008, 62 people were killed in riots. South Africa’s struggles have always been African ones, too. And until Africa figures out a way to deal with the problem, together, the violence will continue to flare up. Willard Rhodes, “Music as an Agent of Political Expression,” African Studies Bulletin 5 (1962): 17. 1. it is true that we Africans supported Mandela but not as foreigners giving foreign aid, we supported him and South African resistance as part of our family. We protected the leadership physically from attacks (not always successfully – my friend Ruth First was letter bombed by apartheid SA ) and provided educational facilties for many. 2. ‘xenophobia’ arising from immigartion/globalisation is a world wide phenomenon. We have the US where Trump has found great support from among those damaged by or believeing they have been damaged by immigration. In the UK a large part of the Brexit vote was attributed to those feeling threatened by the consequences of uncontrolled immigration, and in France, Germany and Austria anti-immigartion parties are on the ascendant. In France the National Front may well be the main opposition and could win the Presidency. Stiglitz, Nobel economist, has stated that the benefits of globalisation i.e. free movement of people has been extremely ‘uneven’ so that even if it benefits the economy as a whole certain sectors, particular low skilled workers, could suffer disproprotionately. To say ‘In so doing, the spirit embodied by South Africa’s national anthem, “Nkosi Sikelel’ iAfrika,” or “Lord Bless Africa,” has been erased.’ is pathetic and shows little political or economic understanding. 4. If globalisation and immigration are world wide issues what can South Africa do? With rising unemployment among less skilled workers there is a great difficulty here and just dismissing it as xenophobia gets everyone exactly no where. Politically and economically it is a very challenging situation. I am sorry to say this but Trishula you are just so un African it may be best to call yourself a sympathetic outsider and identify yourself with your US pasport.